We offer below specified assortment of technological equipment and its accessories for the glass industry. This equipment is determined for chemical polishing of flint glass and crystal one in glass processing plants. It is delivered in different modifications according to the required polishing technology and user's needs. 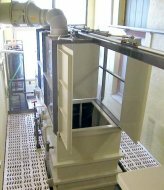 The polishing process runs in a closed tank during rotating movement of the drum at alternate treatment in polishing bath and washing baths. Glass is washed with clean water in one or two open tanks after polishing. Storage tanks for processing baths, equipment for acid dosing and tanks for the slurry sedimentation are a part of the equipment. This equipment serves for automatic etching and washing of drinking glass, decorated by cerography. 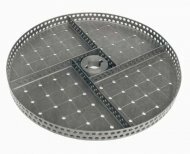 Products are manually stick on etching pallets at the beginning of the line and manually removed from baskets at the end of the line. 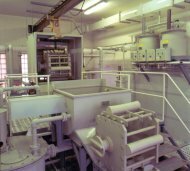 Automatic process runs in a closed etching line, in which etching, washing, product putting in washing baskets, wax removal, next wash in demineralized water and drying go step by step. Fully automatic equipment serves for etching and washing of sheet glass for manufacture of nail files. Complete technological resolution with emphasis to the operator’s safety and the environmental protection. Complete resolution of purification of waste gasses exhausted from the process of polishing or etching with warranties regarding working conditions and outlet emission limits. Plastic air-distributing ducts in a standard assortment or atypical construction according to the client’s requirement. Constructional and material design. The delivery and the assembly including complete accessory. Complete solution for treatment of wastewater from the process of glass polishing or etching with the discharged water quality guarantees. Assembly of technological distribution of media, including deliveries of pipes, shaped pieces, fittings and their supports (embedding). Manufacture of atypical components. Any components of the technological equipment supplied by us may be delivered as spare parts. Spare parts for the equipment made by the other producers may be delivered too, however they must be technically solved, first. We proceed in solving each business case according to the needs and requirements of every client, individually. The scope of the delivery may include anything beginning from the item delivery of individual components to the complete resolution of the submitted production technology, including the design, supply, assembly and commissioning the equipment. The supplier's warranty for the equipment function differs according to the delivery scope. Delivery and other commercial conditions are governed pursuant to the concluded business contract and valid laws. AVT, s.r.o. provides the post-guarantee service for all the supplied equipment. Please, request for the detail technical and commercial information. Automatic glass polishing plant with rotating drums is made of plastic PP-H (polypropylene) mainly. 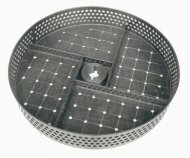 Tank for etching bath is made of plastic PP-H (polypropylene) mainly. Polishing drum is made of plastic PP-H (polypropylen). Polishing drum is made of plastic PP-H (polypropylene). Disc for compound polishing drum is made of plastic PE-HD (polyethylene). 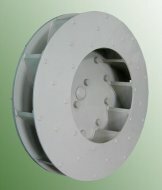 Fan rotor is made of plastic PP-H (polypropylene). Pump for polishing bath is made of plastic PP-H (polypropylene) mainly.